A high-profile but vacant property at 1701 N. Classen Boulevard has sold to local developers. The Dan Dill Companies purchased the building and 1.1 acres of land last month for $500,000 and are exploring development options. The large and elaborate structure is on the northwest corner of NW 16th & Classen, an intersection that serves as a key gateway to the rapidly emerging Plaza District. The building itself has a colorful history. 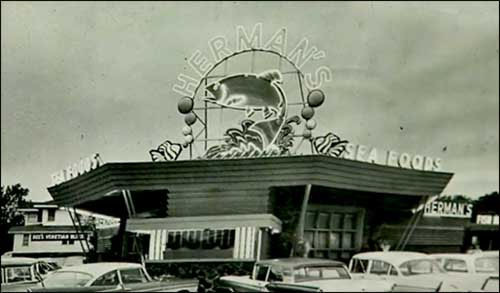 Built in 1949 for Herman's, it was one of Oklahoma's first seafood restaurants and also featured a fish market. 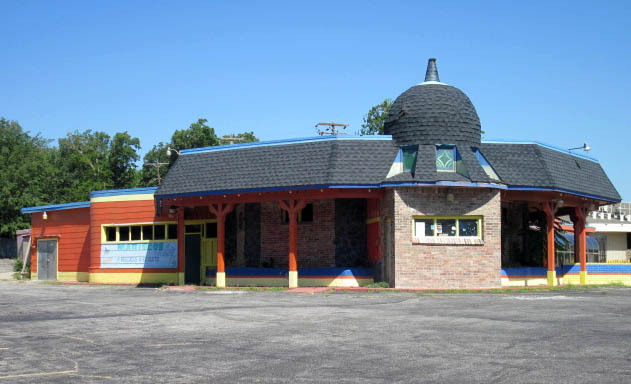 In 1968, the Val Gene's restaurant group bought the restaurant and continued to operate it under the Herman's name, until converting it to Zucchini's in 1976. In 1978, it became the popular Triple's Restaurant and operated until the late 90's. Sometime thereafter it was purchased and operated as Marcos 3 Mexican Restaurant before it closed completely. The property had been sought by several developers who were frustrated by a seemingly unmotivated seller. This acquisition was the culmination of over a year's work on part of the new owners. I'm excited about the possibility of this becoming something cool. Every time I go to the Plaza I think of what this could be. I agree Andrew. That location has so much potential. It's directly off of Classen as well as the main entrance to the Plaza District. Exciting News! The most important thing is that this property is now in the hands of a developer rather than the family that sat on it for years. My understanding is the former owners rebuked lots of interest and were difficult to deal with. It's amazing when someone wants to give an owner this kind of money (half a million dollars) and they have to beg them to even return calls. Fantastic! This lot is too important to keep empty. 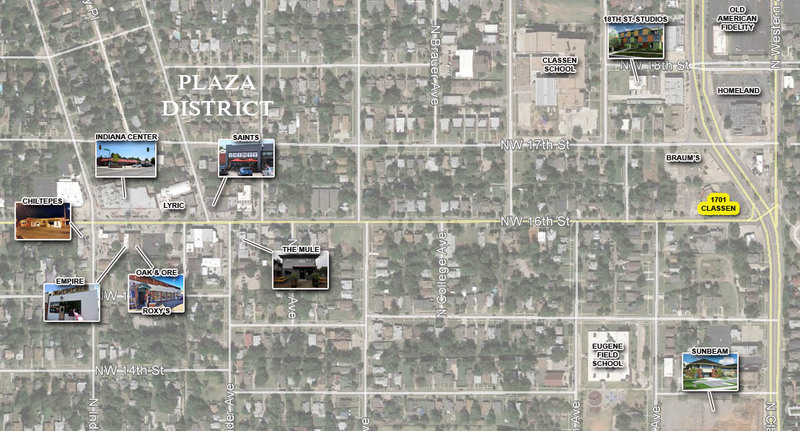 Continued development on Classen and a bridge to the Plaza? Yes, please. Pete, any chance this will be resold to Braum's since they are buying up a lot of things in that area? It's possible, but Braum's has paid very low amounts for the lots they have purchased in the last year; like $40K each. This property was just bought for half a million. Pink is a local LLC that has been developing and redeveloping housing in this area; yellow is Braum's. I can't wrap my head around what Braum's would do with all that land and how big of a Braum's that would be. I would love for everything to leveled in that area and a new grocery store built on that land. That would force Homeland to up their game finally. I know Braum's has plans to rebuild to their new concept, which would explain the lots to the west that they've owned for a while. The two lots to the south make less sense, unless they want to turn that area into parking. I was wondering the same thing warreng. I don't really want to see a new grocery there though, as I think a new grocery would really work the best in Midtown if developed correctly. Even thiinking about the largest Braum's I have seen in the way of space the building and parking take up on NW 39th and Tulsa, that would only really be taking up what they currently have, maybe a little more to the west. Pete, do you have any idea if the structure as it stands now is the original from 1949 with modifications or has it been torn down and rebuilt in the past? The structure is original, just heavily modified. I'm sure it will not be salvaged. I am sure there would be a ton of work to do on it since it has sat vacant for so long. I think it would be a little close, but like a few others have stated in other threads, it would be a great permanent location for a food truck court. The modifications or the original structure will not be salvaged? What do we know of Dan Dill? Are we headed for another parking lot with a strip center? I seriously doubt any part of the building will be salvaged. It looks like he has a company, Dan Dill Electric, in El Reno. Curious if he is looking to expand or if he has prior experience in development, etc. The Dill Companies bought and renovated the old Homeland at 39th & Penn. The also own the Buy 4 Less at 23rd & Penn. They mainly do development / investment work -- this wouldn't have anything to do with their electrical business. Then I guess I am not a fan of their work to date. I hope he can step up his game. I've asked this before with no real answer, but what can we do to get guidelines for Classen changed that requires development with good urban principles, and can we get it done yesterday? 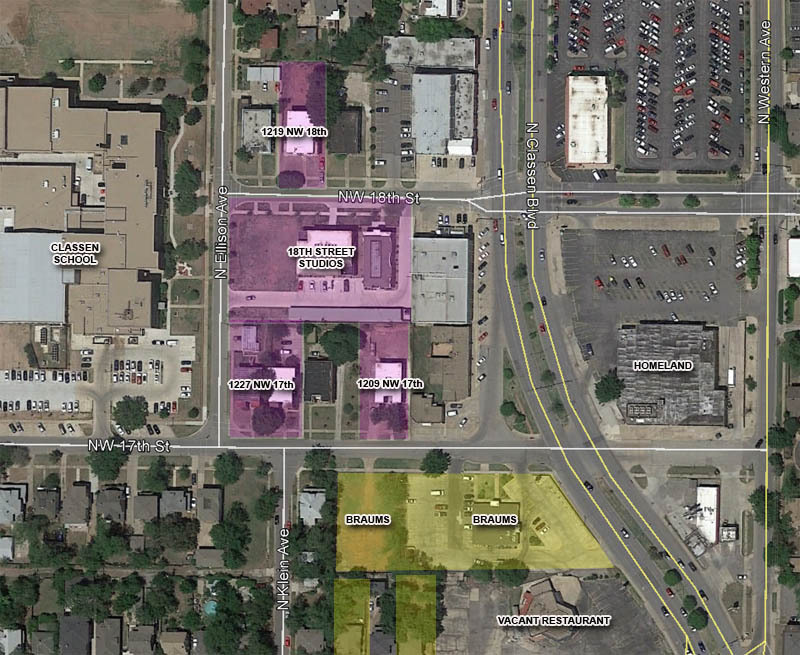 I feel like maybe we exaggerate too frequently when we say "this is an important property"…but I can't help but think that the future of the Plaza in relationship to the rest of the core resides in the hands of how development on NW 16th between Classen and Blackwelder evolves over the next 10 years. This obviously being the most important lot in that equation. I really hope the Plaza people are paying attention and I hope they have the foresight to do everything they can to assist Dill Companies in the process of creating a super high-quality development. To be honest, this lot is worthy of a $5M to $10M+ investment. 2 or 3 stories built to the street with prominent frontage on the first 60 - 120 feet of NW16th, and frontage on the entirety of the lot on Classen, parking in back, nice retail/restaurant space on the ground floor…could even be a grocery store (though not preferable), 5 to 10 units of housing or office space on upper stories. Sure, it may look out of place now, but things should not be built for now…they should be built for where we're going. Good news about this. This building is a bit of dozer bait and might just need to be taken down. I wish they would go ahead and redo the Homeland across the street as well! Do you think they will stay with it and do a grocery store there? The possibility exists to flip this property now that it is the hands of someone who is motivated. $500K for a prime acre still leaves room to flip and make a profit, especially given the location. Glad to see the property finally sell. I've noticed some activity there recently (including an ugly banner from a Democratic Politician go up on the sign). I'd love to see this built to zero lot line specs, multi-use with retail on ground floor and housing above. Classen and Plaza District are PRIMED for quality housing, especially Plaza District, as there is much more demand than supply. A house just sold last week for almost $200K WEST of 16th on Ellison, and the house next to it is being redeveloped by the same flipper. We are definitely paying attention and have formed a design/use review committee consisting of stakeholders from Plaza District, Gatewood, Classen Ten Penn that have a good understanding of design and vision for the neighborhood as a whole. Although we are limited on single family development, we do have the opportunity to work with developers seeking to rezone. We expect to connect with this new developer, and we are hopeful he will be open to working with us to ensure this project is great for the neighborhood. Is there any thought as to creating a formal design review district (ala Bricktown and others) or at least extending the boundaries of the existing Urban Design Commission? This would have to happen through the City, obviously. New Restaurant to Norman - 3000 Classen (Hwy 9 & Classen) - any thoughts?